This month’s animation shows how supra eruption can occur if the anteriors are not contacting. The objective here is to help you explain to patients who come into your office with eruption problems understand what’s happening with their teeth and that if the eruption has only happened recently, something else is likely to have happened that changed their bite – possibly some kind of injury to the condyle, or degeneration in the condyle, or other problem that you’ll have to investigate. 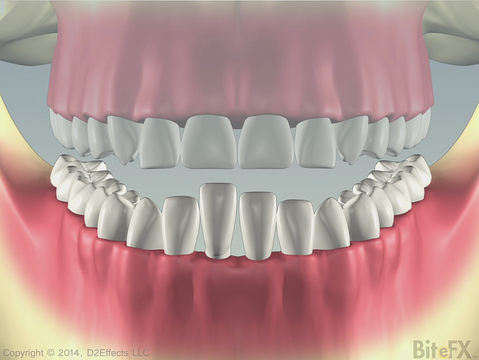 The animation first shows the bite from the side - that there is an open bite at the front so the contacts are all in the back teeth, not the front teeth. It then brings the camera round to the front so the viewer can observe the lower teeth erupting as they have no counteracting force keeping them in place. Thank you to Dr. Robin Steely and Dr. Don Reid for requesting this animation and giving their input. Not yet a BiteFX customer? Read Dr. Reid's letter about our no risk offer and how you can stop those blank stares that make cash slip out of your pocket!